Sizes available: 5/6 lb., 15 lb. and 30 lb. Conventional wisdom once was that that senior dogs needed less protein. However, that only caused them to lose muscle and have less energy. 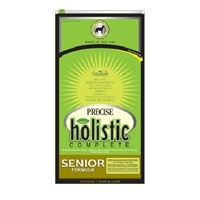 Instead, our senior formulation features normal adult protein levels and moderate fat to provide energy. 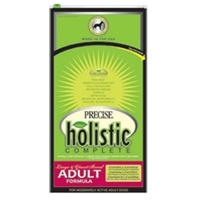 This formula is designed for those puppies that will reach 50 pounds or more as an adult. Its triple meat protein source builds good solid muscle, providing optimum calcium and phosphorus. In addition, there are slightly fewer calories so that puppies don’t gain too much weight before their bodies are ready to support it. For mature dogs weighing 50 pounds or more. Features triple meat proteins, which help maintain solid muscle – whether working or playing. Calcium and phosphorus levels have been adjusted for dogs that have reached their full size. 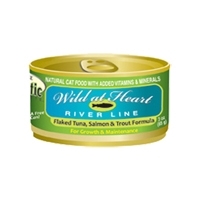 Cats are sure to devour this all natural, flaked variety that features not two, but three well-loved seafood flavors. We start with salmon, tuna and trout, then add select vegetables, botanicals, and herbs, to provide all the essential vitamins and nutrients needed for lifelong health and vitality. 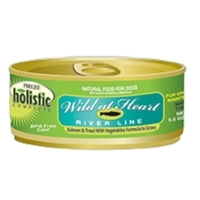 Precise Holistic Complete® Wild at Heart – River Line for Cats features the high-quality proteins found in salmon. Herbal ingredients, nutritious fruits and vegetables, probiotics, and more good stuff makes this complete recipe for cats to thrive throughout their lifetime. This natural, holistic canine formula features the tasty seafood duo of salmon and trout, superior protein sources. 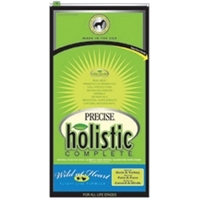 Carrots and peas are added along with a complementary herbal and botanical mix that creates a wholesome, balanced diet that will keep your canine vital and healthy through all life stages. 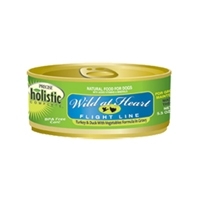 Precise Holistic Complete® Wild at Heart River Line features the high-quality proteins found in salmon. Herbal ingredients, nutritious fruits and vegetables, probiotics, and more good stuff are what dogs need to thrive. It makes this formula complete nutrition for a lifetime. 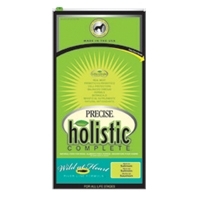 Precise Holistic Complete® Wild at Heart — Flight Line Formula is rich in duck and turkey, high-quality proteins from unique sources, herbal ingredients, nutritious fruits and vegetables, probiotics, and more good stuff dogs need to thrive throughout their lifetime. 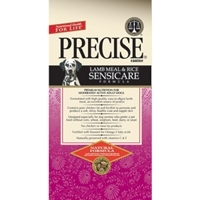 Precise Canine Chicken Meal & Rice 30 lb. 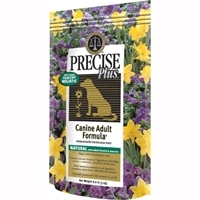 This Precise® premium formulation was specially developed for discriminating dog owners. Precise® Chicken Meal & Rice Formula® is formulated with chicken meal, ground brown rice, ground oats, and other high quality sources of protein and carbohydrates. Sizes available: 5/5 lb., 15 lb. and 30 lb. Precise® Sensicare Formula® was developed for dogs with food allergies. So the formula doesn’t contain wheat, corn, soy, beef, or chicken protein. Precise® Senior Formula is specifically formulated for the nutritional needs of older dogs and can help prevent serious problems known to shorten an aging dog’s life. This is our reduced protein, the reduced fat formula for dogs who are less active or overweight. Many dog food companies produce a lower calorie version of their regular food by adding fiber and filler. Because puppies’ internal organs are delicate and constantly developing, they need nutritious, easily-digestible food. Puppies are full of energy and playful enthusiasm. The combination of chicken and lamb protein in Precise® Small & Medium Breed Puppy Formula assists in the growth of all types of tissue. It is designed for weaning puppies of small and medium breeds up to the age of twelve months. Small & Medium Breed Puppy Formula is preserved with natural antioxidants to give your puppy a chemical-free start in life. And we add easy-to-absorb, chelated minerals to help build a strong body. 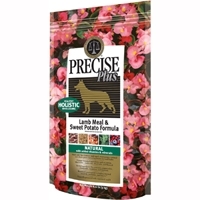 Precise Plus Canine Lamb Meal & Sweet Potato 5/5 lb. Finally, an all-natural, holistic lamb and sweet potato formula that delivers excellent nutrition, great palatability, and outstanding digestibility. This is accomplished with the use of EU-certified New Zealand lamb meal, low-glycemic sweet potato, and added holistic supplements that include probiotics and antioxidants—added health benefits for the wellness of your pet. Available in 5-lb (2.26 kg), 15-lb (6.80 kg) and 30-lb (13.6 kg) bags. Sizes available: 5/6.6 lb. and 16.5 lb. 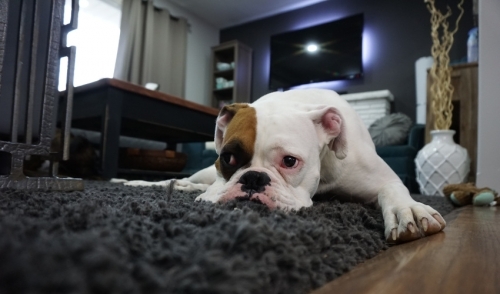 Puppies need added energy to help in the growth of developing organ and muscle tissue. 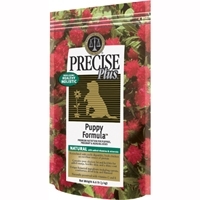 Precise Plus® Puppy Formula is a premium puppy food made from chicken and chicken meal. Sizes available: 5/6.6 lb., 16.5 lb. and 33 lb. This is the pet food formula for you if you want the absolute best for your dog. Precise Plus® Canine Adult Formula® contains all the premium nutritional ingredients your pet needs, plus some select botanical ingredients, herbal ingredients, and probiotic ingredients to promote health and wellness. Precise Canine Endurance 30/20 40 lb. This is our 30% protein super stamina formula for dogs that need more energy to “go the extra mile” or have difficulty maintaining weight. Sizes available: 5/5 lb., 15 lb., 30 lb. and 40 lb. Precise® Chicken Meal & Rice Foundation Formula™, our best selling pet food, is a wholesome, natural food. Made of real chicken meat protein, whole grain carbohydrates, pure chicken fat, and vitamin preservatives, it has been found to be over 90% digestible. We don't know of another food that comes close. The pleasing aroma, texture, and taste of this formula combine to yield exceptional palatability. Inspect it yourself and you'll see what we mean. 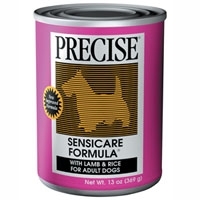 Precise Canine Sensicare Can 12/13.2 oz. No wheat, no corn, no soy, no beef or poultry protein. This Precise® Sensicare® canned formula was developed for dogs with food allergies. Lamb and rice plus a balanced combination of natural antioxidants, vitamins and chelated minerals provide all the nutrition your sensitive dog needs without any of the foods he can’t tolerate. Precise Puppy Can 12/13.2 oz. Active, energetic, full of play. 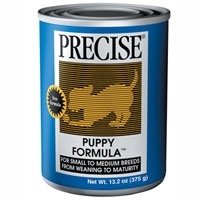 For weaning puppies up to 12 months old, the combination of meat proteins in this Precise® canned recipe assists in the growth of all types of tissue. 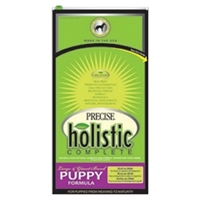 Natural antioxidants, vitamins and chelated minerals help your puppy get the right start in life. 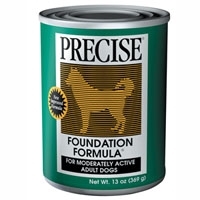 Precise Canine Foundation Can 12/13.2 oz. 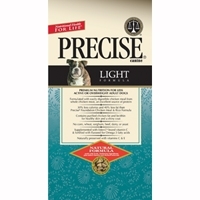 Precise® Chicken Meal & Rice Foundation Formula®, our best selling pet food, is a wholesome, natural food. Made with real chicken meat protein, whole grain carbohydrates, pure chicken fat and vitamin preservatives, it has been found to be over 90% digestible. We don’t know of another food that comes close. The pleasing aroma, texture, and taste of this formula combine to yield exceptional palatability. Inspect it yourself and you’ll see what we mean. Precise Canine Competition 26/16 40 lb. Precise® Competition Formula® is our extra protein, extra fat formula for dogs that get exercised more than the normal house dog, but not for those experiencing a high level of training or long periods of work. © 2019 BarkMart, Inc.. All rights reserved.